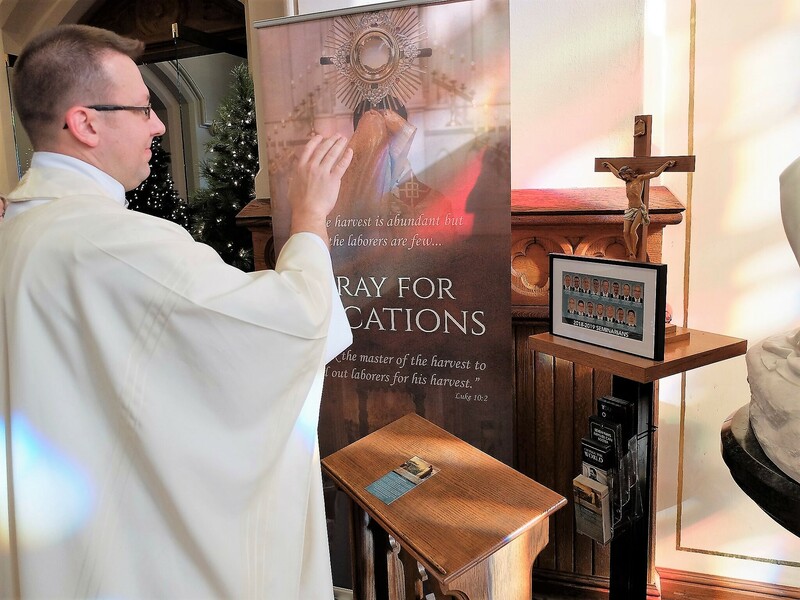 A new traveling vocation crucifix will visit different parishes throughout the Diocese of Erie in an effort to encourage and support religious vocations. Father Michael Polinek, vocations director for the diocese, blessed the crucifix during a Mass and ceremony at St. Peter Cathedral in Erie on Sunday, Jan. 6, the Epiphany of the Lord. The crucifix serves as a reminder and provides a place to pray for the young men and women who are discerning their vocations. It is mounted on a wooden platform, on top of a three-foot metal stand. In front of the cross is a framed photo of the seminarians studying for the Diocese of Erie; a kneeler is placed in front of the crucifix for one to pray. Affixed to the stand are pamphlets and prayer cards, including the Erie Diocesan Prayer for Vocations.